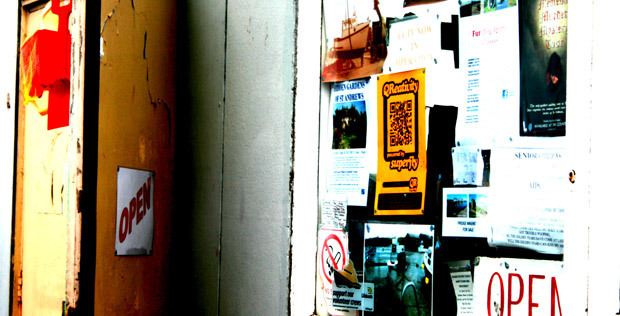 A Space Hop, as defined by Jon Gill’s SuperFly dictionary, is a treasure hunt using a specially tagged Google map, a series of QR codes distributed across the city and a mobile device equiped to scan them. This ‘Hop’ was designed as a ice breaker for PHD students gathered for a Summer School at St Andrews University focusing on eTourism. The game was designed as the culmination of Jon’s Masters research focusing on evolving role of storytelling through social media and video games; more importantly the emerging question of how can we use these tools in creative, engaging and useful ways for advertising/marketing, entertainment and especially education. The game in ST Andrews had five teams of five members each. 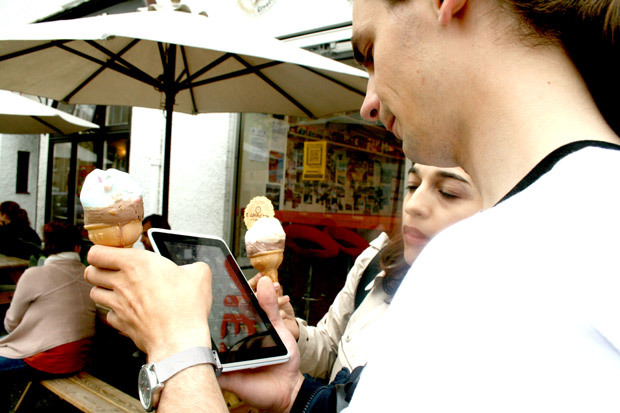 Each team had a HTC Flyer Android Tablet to view the map, scan the codes and complete the prescribed tasks of capturing photos and video. In addition each team had a ‘scribe’ documenting their progress on video. It wasn’t the most comfortable experience for the students. Firstly it was a very wet day but spirits were not entirely dampened. Additionally, as well as mobile devices that they had never used before a condition of the game was for each team to carry a Space Hopper around with them. The different coloured hoppers helped identify the images and video as they were sent during the game. It also created a talking point when engaging with the public for certain tasks. Below is a rough cut of some of the video captured during the game where you’ll see the teams fulfilling the prescribed tasks of asking for the help of passers by, capturing video in certain locations and finding key historic objects and photographing them (with Space Hopper in shot). The game was more than an opportunity for the students get to know each other (an St Andrews) it was about understanding how people experience. Not just cities or holiday destinations, it’s more about how we experience ‘moments’. Why should these moments such as these be shared online? There are lots of reasons not to share, privacy, safety, etc. But beyond the benefits to advertising and tourism what are the benefits to individuals? Space Hop presented many insights that, in retrospect, were apparent from the experience of games like NEoN Knights and SuperFly Safari, just slightly less obvious. However, the lessons learned were consistent and will filter into future projects of this sort and provide further insights into the behaviour of tourists, students, workers, service users, you name it… this knowledge is scalable across many contexts.